IGW-6TGX-APCTR enables Internet access for a large number of users from an Ethernet or WIFI access point in community environment such as hotels, university, hospitals, conference centers, airport, hot-spot. Gateway performs Authentication, Authorisation and Accounting functions, and traffic routing to the Internet access. Embedded Firewall with ACL, DoS protection and L7 packet inspection guaranties secured and controlled user connections and traffics. IGW-6TGX-APCTR is a WIFI Access Point Controller with automatic AP detection and configuration. 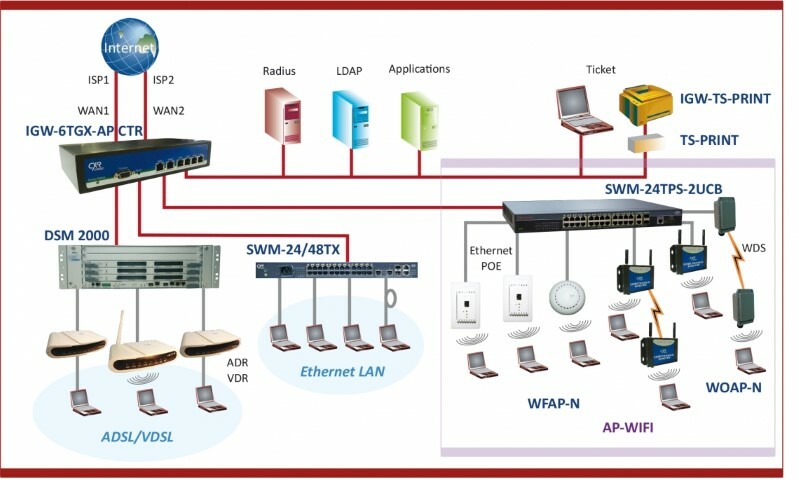 Monitoring and control functions are displayed by a graphical software with details on the network load, user activity and IP address allocation. IGW-6TGX-APCTR gateway works with a comprehensive range of access products such as ADSL / VDSL DSLAM and CPE, WIFI Access Points with all kind of integration format, and in-door and out-door environment classes. A ticket printer kit enables login - password ticketing with defined availability for hotel requirements. IGW-6TGX-APCTR gateway can serve up to 500 simultaneous user sessions through two WAN / Internet Gigabit Ethernet ports. Several gateways may be cascaded to increase capacity.